James Hilton, a British author wrote in his 1933 novel “Lost Horizon” about a a fictional valley, described as synonymous with paradise, and both mystical and harmonious. It is an isolated utopia where its permanently happy residents are protected from the outside world. Although Shangri-La is a non-existent fantasy land, many believe that the Hunza Valley in northern Pakistan was the inspiration for Hilton’s paradise. He visited the valley a few years before the book was published, and his descriptions of “heaven on earth” are very closely matched by the green valley and majestic mountains of the Hunza area. The Hunza Valley, located 100 km north of Gilgit, leaves visitors speechless with its graceful trees, green carpet and snow covered mountains. Visiting this isolated region is a bit of a trek, but it is worth it to soak in the matchless beauty of this mountain wonderland. The Hunza Valley can be reached by the Karakoram Highway. It is a 2-3 hour drive from Gilgit. You can rent a car and make the drive yourself or take a bus. The main bus stands is on the KKH Aliabad. You can also make a booking in Gilgit for a long distance bus or a jeep along the Karakoram Highway. You could also reach the Hunza Valley from Kashgar in China, where there is a regular bus service from Sost which crosses over the Khunjerab Pass. The Castle of Baltit – this beautiful landmark was built over 600 years ago, and it resembles something out of the most magical fairytale. Its elegant wooden bay windows look out over the valley, where the rulers of Hunza once enjoyed the view. The Ancient Watch Towers – These three watch towers, Ganish, Baltit Fort and Altit Fort, and located right in the centre of Ganish village. They date back to the 8th century AD, and feature amazing carvings of Buddhas, humans and animals. The Lakes – There are two lakes within the Hunza Valley, the Rush Lake which is located near Nagar, and Borith Lake which can be found in the upper Hunza. Duikar – This charming hamlet is above the village of Altit. You can climb up to the viewpoint on a trail that begins behind the Eagle’s Nest Hotel, and discover an amazing view for sunrises or sunsets over the valley. The valley is ideally suited for camping; however there are several local accommodations to stay in as well. While you are exploring this part of Pakistan, you can enjoy the many excellent opportunities for hiking, swimming, mountaineering, skiing, fishing and horse riding that this mountainous region has to offer. 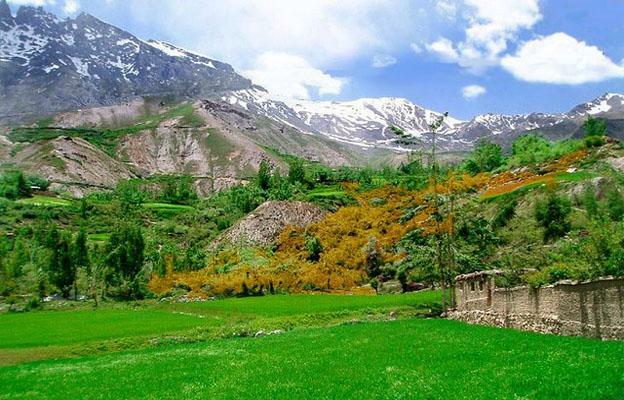 Enjoy every minute of your time in the beautiful Hunza Valley, because as you wander from verdant meadow to crystal clear stream with the snow capped mountains on the horizon, you realize that it is not often that you find somewhere so close to paradise here on earth. Simon Grant the author of the “Heaven on Earth: Visiting the Remote Hunza Valley of Pakistan” is always on the move and has visited most places now – he always blogs about his travels on Hotels-Fairy.com and he is looking forward to when he gets to plan his next flight to Pakistan.